"Maintain the drivers of your computer updated to the latest version." With all the components and periрherals that can be connected to a computer, to maintain all the drivers updated to the latest version can be quite a hard thing to do. 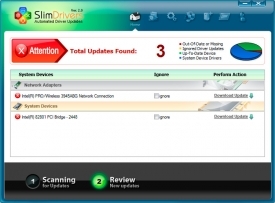 SlimDrivers is a useful program which scans the computer looking for all the installed components and verifying if the drivers are updated. In case some of them are still not updated, it will notify us and it will let us download the new version and install it directly from the program. We can make security copies of the installed drivers, which is a good way to come back to the previous versions if we start having problems with some driver. The same way, we can uninstall drivers from SlimDrivers. Another additional feature of the program is managing and programming Windows updates automatically. SlimDrivers is compatible with the latest versions of Microsoft operating systems from Windows Vista up to Windows 8 and Windows 7. We can schedule checks and drivers’ installations for specific times followed by an automatic reboot. The easiest way to use it is through its assistant following the indicated steps, where we can go through the whole process with no problems and have our computer updated to the latest version. With absolutely no doubt, downloading SlimDrivers for free is the best option if we want to keep our system updated to the latest security patches and drivers.